Jet lag can’t keep my brain frozen under these conditions. Nor can the chill of the Norwegian winter wind. Things are happening. God’s work moves forward with dynamism. If you’ve been praying, keep it up. Study has been deep. Today is the first day of planning. I’ll post some pictures later, if time allows. 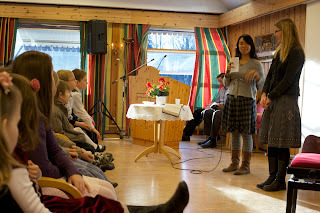 A random picture from Church yesterday- Children's story in progress. I have been and still am praying :) May God be with you and guide your decisions.